You surely need to have a proper sound system if you really love music – after all, you miss half of its beauty if you don't. For the ones who prefer enjoying this form of art through headphones, there's a new headphone amplifier that will treat your ears just right. Despite the rough, 19th century industrial look, with an aged linden wood faceplate and milled thick aluminum parts, there's a gentle soul inside. This 6.5-kg-headpone amplifier sounds balanced and precise and makes an important visual statement on your desk – no wonder it was a great success among visitors at this year's Munich High End Hi-Fi show. Due to the complexity of manufacture, Erzetich plans a very limited yearly production of this completely hand crafted, prestige headphone amplifier, dedicated to the ones that can appreciate exclusive high-end audio components. 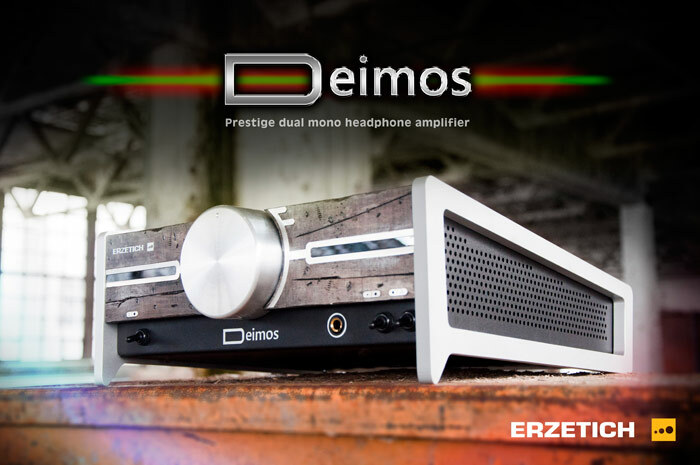 Deimos will be available at the beginning of 2015 for around 4,000 EUR, while Erzetich will start accepting preorders with a special discount in late September. For more information visit www.erzetich-audio.com.